The aesthetic appeal of living walls and indoor gardens has certainly increased the demand for companies who not only manufacture indoor gardening products, but provide indoor gardening services as well. These companies alleviate much of the leg -work that goes into designing and planning indoor gardens, and are also a convenient option for maintaining the health and vitality of the garden. The convenience of indoor gardening services includes their expertise and provision of education to their customers. With their knowledge, indoor gardening service professionals will select the best types of plants for your needs, design the perfect gardening system for the space in question, and educate on maintenance requirements as needed. Restaurant owners are turning to on-site soilless gardening systems to grow their own herbs and vegetables, responding to the increased demand for hyper-local food. 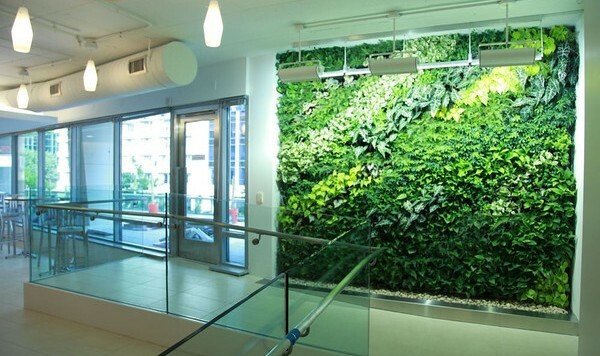 Employers today are more aware of the benefits of growing plants in office spaces, which is why living walls are a great solution to increase productivity and add natural beauty to the workplace. Edible walls allow urban residents to grow and pick their own fresh herbs year round right in their very own kitchen. Read more about full-service indoor gardening.Feature Image: An office with a living wall. Image via Matt Cohen, NRDC.